Today in Iran, people are imprisoned for simply voicing their opinions. United for Iran empowers a growing global network of issue experts, coders, developers, and activists to create an Iran where civil liberties are respected. Our technologies empower Iranians to keep informed, voice their beliefs, stand up for the values and organize. Our campaigns raise public awareness and directly pressure the Islamic Republic of Iran to spare lives, release prisoners and stop persecutions. The global United for Iran community acts on behalf of individuals, their families, and the community of people working for a free Iran through technological innovation, online advocacy, and public education. 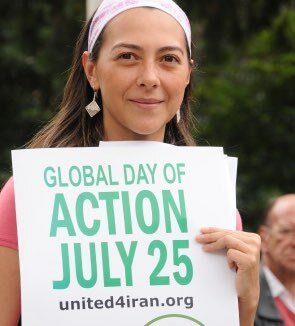 Since 2009, more than 250,000 people from 110 cities have participated in actions and events sponsored by United for Iran. Iran’s youthful, tech savvy, and increasingly connected population includes 40 million smartphone users – – citizens who literally hold the potential for unprecedented global access and government interference in the palm of their hand. Yet there are few ways for people in a closed Iran to use technology to support civic activism. We wanted to bridge the gap in technology and social change. In 2014, we began developing apps to enhance civic engagement and government transparency. 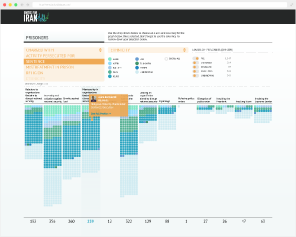 In the spring of 2016, we launched IranCubator, a two-year contest-focused project to leverage and build the capacity of both civil society and developers. We developed about a dozen applications that directly empower Iranian citizens to connect, organize, share and disseminate critical information. Apps that range from documenting and reporting on domestic abuse, keeping Iranian voters informed and giving them an easy to use and practical platform to share their voice. United for Iran launched the Iran Prison Atlas in 2012 as a real-time tool for documenting the background, treatment, and procedural violations of the cases of Iran’s political prisoners. Since its inception, Iran Prison Atlas has been overseen and updated by former political prisoners, utilizing their experience and contacts. 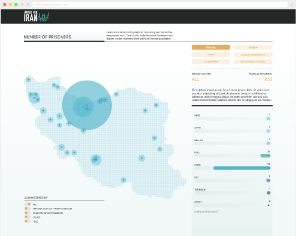 The Atlas now provides a more complete view of Iran’s prison system and contains over 2,000 records on Iranian judges, prisons, and political prisoners. United Nations officials, national governments, and advocacy groups worldwide use the Iran Prison Atlas. By sharing information on political prisoners, the judges who convict them and prisons that hold them, the Iran Prison Atlas shines a bright light on Iran’s judiciary system and ensures that every time a courtroom is used to take the life or the liberty of a human right defender, the world will know. Safe Activism: Reducing the Risks and Impact of Arrest grew out of United for Iran’s work with activists in Iran facing arrest, arbitrary detention, and violence at the hands of the Islamic Republic for their peaceful civic and political activism. Interviews with over 30 former Iranian activists were used to identify essential tactics to avoid arrest, incrimination and imprisonment. 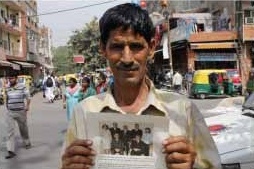 Safe Activism delivers information in multiple ways, including video, infographics, and a booklet. Since September 2015, the Safe Activism video has been viewed 50,000 times and the booklet has been downloaded by 3,000 individuals in Iran. United for Iran was born from a global grassroots movement to end human rights violations and support democracy in Iran . Our campaigns give people who support a free and open Iran ways to support political prisoners and civic activists in Iran who are advocating for systemic change. We aim to be creative and measured to build momentum and keep critical issues in the public eye. In 2012, United for Iran collaborated with a global network of artists and musicians to release an album of music to draw attention to human rights in Iran. 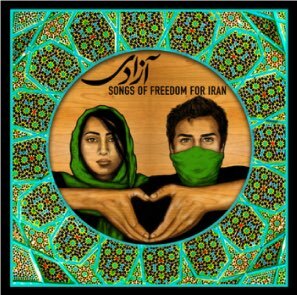 “Azadi: Freedom Songs” for Iran is an expression of the intersection of art and human rights and demonstrates how art can be used to inspire solidarity and transform movements. Azadi features musicians from Iran, Egypt, Libya, South Africa, the United States, Palestine, Iraq, Sweden, and Japan, including Mohsen Namjoo, Kiosk, Abjeez and Salome MC. Iran’s first female rapper. In total, the CD received 53,000 streams and thousands of downloads. The CD remains online, and is available for free streaming and download.